What's is a swicki on Squidoo. [Editor's comment: Could a Chesterfield be classified as a comfy chair? 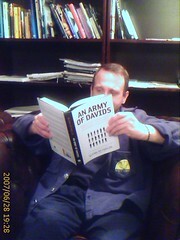 I got my hands on An Army of Davids (hardcover edition $5) by Glenn Reynolds for $14 in total, including shipping and handling to Sweden. (I saw the offer in a Pajamas Media ad on my blog.) I will put the book in our library at Blue Chip Business Center & Café. I have read the first chapter. The third chapter has the title, The Comfy Chair Revolution. Is the idea of America as an melting pot dead? Have you heard about the Aztland movement? Related: My post, FAITH, CLOSED BORDERS AND NO GAMES. It is time to kick-off the midweek roundup of blog posts again. I will try to publish it on Wednesdays, but it could occur on Thursdays too. I have updated my blogroll. I think I will keep my blogroll to a limited number of blogs, e.g. 30 blogs. Gus Van Horn is good at tracking new and interesting blogs. Check out his latest roundup. For more blogs, read Anita Campbell's post, Interesting Blogs Roundup and the blog review at Pajamas Media. Could the fuel rations in Tehran spark further resistance against the mullahs? Related: My post, KEEP THE FIRE GOING IN IRAN! Encyclopædia Britannica is not throwing in the towel... Is it really a battle between Britannica and Wikipedia ? I have created a simple timeline called America. Maybe you are interested in reading about Sweden or Aristotle? Justice Done: Dry Cleaner Wins in Missing-Pants Case. AP / Breitbart via Pajamas Media. Court limits student speech in 'bong hits' ruling. AP / Houston Chronicle. Please continue this thread by a trackback or linking back to this post from your blog. Here is a quote from the article, Tax resisters finding allies in cyberspace, in The Boston Globe. It is time for Friday Ark. It is midsummer holiday this weekend. I will try to post a recipe tomorrow. You could now subscribe to EGO posts via email. Write your email address in the box in upper left corner. The autoroll widget from Criteo is temporally taken off the blog due to loading problems. The virtual Chumby is replaced with a video (at the bottom of the left column). You could do a Google search in the Research category and thereby support EGO. You will find Google AdSense ads included in the individual posts. I missed to publish a venting post on Thor's day, so I have to start some thunder by adding a new EGO poll. The original poll was created at Bravenet. I have to update my blogroll... Do you know any alternative to Blogrolling? Have you seen my autoroll? Metro ("The World's Largest Global Newspaper") has started a blog service. You will earn SEK 0.03 if a visitor is reading one of your posts. Talking "Tech Tuesday," John Strömstedt's blog, GadGeeks, is one of the star bloggers at Metrobloggen.se. Check out the new EGO blog at metrobloggen.se/ego. I am contemplating to start with a weekly schedule of special posts in order to publish stuff on a regular basis. Monday - Open thread post. Tuesday - Tech stuff, gadgets, web 2.0, blogging trends, etc. Wednesday - Mid-week blogrolling. I have to update my blogroll. 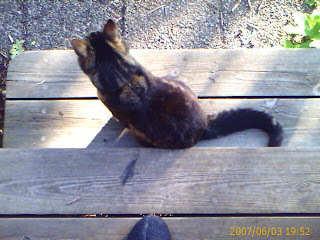 Friday - Catblogging for the Friday Ark at the Modulator and writing a post for the Carnival of the Recipes on Saturday. Maybe a quiz or meme and some weekend reading material. 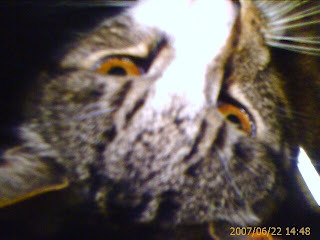 Saturday - Writing posts for the Carnival of the Cats and the Carnival of the Capitalists. Sunday - A day for future podcast / radio / tv shows? Flemming Rose, cultural editor at the Danish newspaper Jyllands-Posten, has joined Pajamas Media. Check out his blog, Northern Light. Related: My post, JIHAD AGAINST THE WEST. Double-click on any word and get tips from Answers.com. I want a Chumby gadget! Now you could find related blog posts and news articles if you click on the Sphere link. I think my readers will "digg" this new feature... The service is provided by FeedBurner. Subscribe to the new EGO RSS feed. What do you say about Lieberman's comment? Related: My post, NUKE IRAN. I am back from my mental blog break. It has been pretty hard to stay away from the blogosphere during my break. I want to thank my guest bloggers for your great posts! It will take me sometime to catch up to speed again. During my break, EGO blog passed another milestone. This is post #2001. And now time for a batch of catblogging! 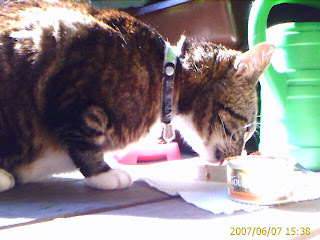 Morris eating "gourmet" cat food. 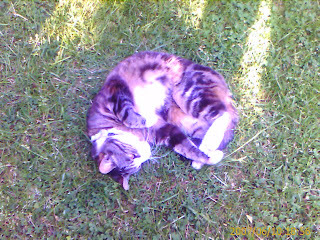 Morris playing around in the sun. While the old Greeks valued the Sun so much that they named their country after it, many of today's mainstream "scientists" seem to think that sunshine ("UV exposure") is nothing but a health risk and the best we can do is avoid it altogether. At current rates, 1 in 5 Americans will develop skin cancer during their lifetime. UVB rays are stronger in the summer, but UVA rays are constant year-round. This means sun protection is a year-round responsibility. Everyone, regardless of outdoor activity, skin type, or age, should wear a broad-spectrum sunscreen or sunblock with SPF 30 or higher- everyday. Save the skin you are in... If sunscreen is not applied properly, it cannot do its job of protecting your skin and saving your life. There is no such thing as a healthy tan. A tan means skin damage. even when you are in your car or your house, the sun could be doing harm to you. Taking this to its logical conclusion, the healthiest way to live would be to stay in a bunker deep under the ground all the time and apply sunscreen five times a day, just to be sure. And, of course, always wear UV-protective sunglasses! Am I the only one seeing something wrong with that picture? President Bush came down with a stomach ailment Friday at the G-8 summit in Germany and is resting in his room. "I'm not sure if it's a stomach virus yet or something like that," Dan Bartlett, counselor to the president told reporters. "He's just not feeling well in his stomach,"
I would be sick to my stomach too if I had to spend three days in the company of people whose greatest priorities are to give away the wealth of the West to savages and to reduce economic activity (= "greenhouse emissions") by 50%. I hope one day America will have a President who, upon seeing such an agenda, will save his stomach the upset and tell the Europeans that he's staying in the White House because he's got nothing to talk to them about. If wasting £400,000 on designing a ghastly nihilistic logo were an Olympic discipline, we would have a sure winner today. When people see the new brand, we want them to be inspired to make a positive change in their life. I suppose if your life has been terribly, horribly, miserably awful, looking at this image will make you feel inspired to upgrade to just terribly and horribly awful. But then, the same inspiration can be achieved slightly more cost-efficiently by striking a hammer against your bathroom mirror. See here for some more comments and parodies. Is a black cat a good company on my way to the sixth level of hell? Morris didn't go with the witches to the Blocksberg mountain last Easter. I wonder if I will meet Dean Martin in the limbo lounge? St. Dean (06/01/07) by John Cox. To assume that it is a problem is to assume that the state of Earth's climate today is the optimal climate, the best climate that we could have or ever have had and that we need to take steps to make sure that it doesn't change. Jerry Mahlman, a former top scientist at the National Oceanic and Atmospheric Administration, said Dr Griffin's remarks showed he was either "totally clueless" or "a deep anti-global warming ideologue". James Hansen, Nasa's top climate scientist, told ABC News: "It's an incredibly ignorant statement." Dr. Griffin, welcome to the club.